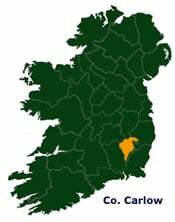 The traditional holiday ingredients, which attract visitors to Ireland, are all encapsulated in Carlow, Ireland’s smallest inland county. This “Celtic Center of Ireland” contains a repository of some 807 field monuments marking the centuries back to megalithic times. Enchanting river valleys with a rich agricultural hinterland, a navigable waterway of great charm and the glorious ridges of the Blackstairs Mountains and Killeshin Hills provide an unspoiled environment for the golfer, rider, walker, cyclist and angler. The intimacy of the towns and villages and the warmth of rural Ireland complete the recipe for a unique holiday experience. Carlow is a holiday destination to satisfy the traveler who wishes to discover the essence of a place. Located in Ireland’s sunniest region – the Sunny South-East, the county is ideally located to explore the Wicklow Mountains, Kilkenny, Waterford, Wexford and Dublin.